Note: This is by far the longest post I’ve written (so long that I haven’t even proof-read it yet). It’s quite different to my usual ones as I wanted it to be a true account of my experience of the day. If you’re a regular reader and this doesn’t interest you please just skip through as I’ll have another new post up towards the end of the week. Staffin slipway after the stranding. Hoping that the whales are now far from here. 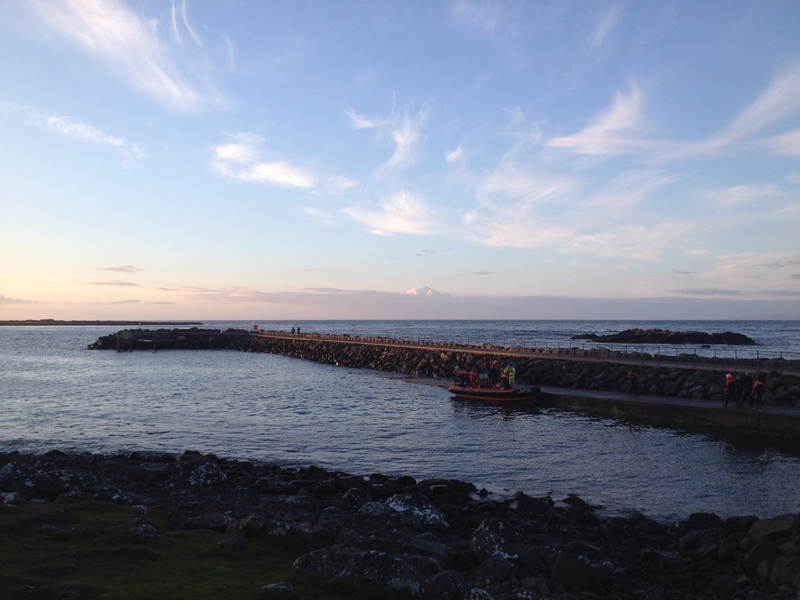 As some of you have noticed, my last blog post described the night before the mass whale stranding in Staffin last week. What started off as an evening of fun and awe turned into a day of struggle and emotion. This post is a personal account of events and is not endorsed by BDMLR or any other official body. I write from the perspective of someone who is devoted to marine conservation but who has no official qualifications or training in the subject. That might sound like hyperbole but it’s not; looking after our ocean environments is one of the most important things in my life and to be nearer to the sea is one of the reasons why I left London for Skye. Yet all the report reading, the project launching, the networking, the weekends at Whalefest and the constant campaigning means nothing when you’re faced with a struggling creature that you know so much about but, in reality, you’ve had no hands-on experience with. Like most people who love wildlife, I’ve always wanted to get as close to animals as possible, to study them and see how they work. After the strandings I think we’d all prefer to watch these creatures from afar (in fact, I’d prefer not to see these particular ones ever again). It’s an overcast Tuesday morning and indulging in a few extra minutes in bed means that I’m cutting it fine for getting to the gallery on time. The road through Staffin from the North skirts round the bumpy slopes just under the heights of the Quiraing. Once you pass through the strange little hillocks around Flodigarry you can catch a glimpse of Staffin Bay far below in front of you. The flat water catches the morning light in a way that makes it look like it’s made out of that textured foil used to wrap chocolate; it’s a beautiful thing to wake up to and I always make a point of trying to take it all in. In the exact spot where I’d stood the evening before there was some kind of commotion; a group of people and a boat in the water nearby. If I had stopped I would’ve been late to open up the gallery so I carried on. But passing by I couldn’t help feeling that something was wrong. I wondered if it was an animal in trouble or whether someone had somehow been injured or got into trouble in the water. As I drove on into Portree I tried to assure myself that it was just a group of tourists whale-watching (as I had done the night before) but I couldn’t shake a nagging feeling that something bad had happened. Arriving at work I forgot about the people on the beach and set about opening up the gallery. The usual routine… Lights on. Set up till. Music on. Grab a cup of tea. Check phone. My usually-minimal screen was flooded with little notifications. Whatsapp, texts, Facebook… everything. My coat was on and I was out of the door within 30 seconds. I didn’t just drive North; I flew. I’ve always been a very cautious driver up here, slow and steady like a tourist, not a local. This time I could have overtaken any lifelong island resident. A quick stop off to pick up a wetsuit (thanks Birdy at Single Track), some water socks (thanks John at Skye Adventure), some juice for the volunteers and some towels and sheets for the animals then it was straight to Staffin. The rescue effort had moved from the Western side of the bay (Brogaig Beach) to Staffin Slipway by the time that I had arrived. 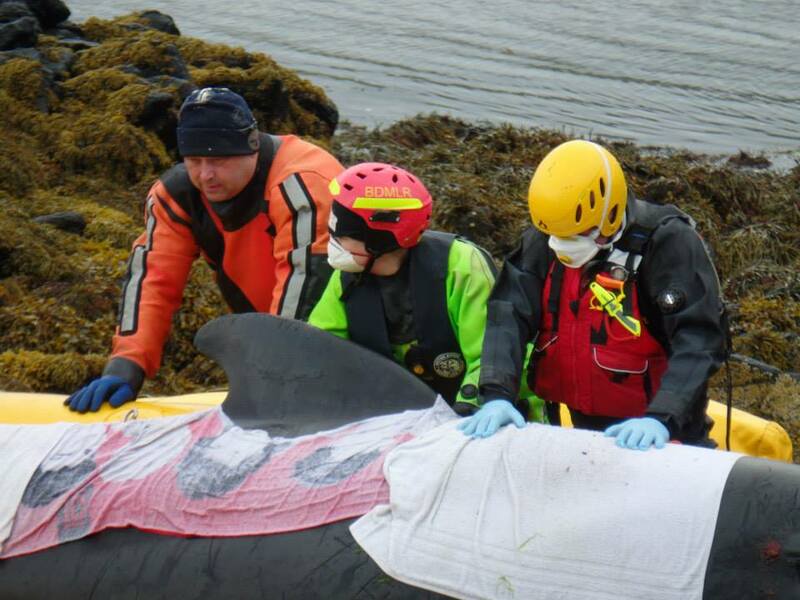 21 long-finned pilot whales had stranded that morning on Brogaig and 18 had been re-floated successfully. Of the whales that didn’t make it one was a mother who had been having difficulty giving birth to a calf (this is the suspected reason for the stranding). Despite the ease of this initial effort, 10 of the whales went on to re-strand on the rocky shore of nearby Staffin Island. This wasn’t just harder for volunteers to reach but also a nastier surface for the animals to be stuck on. There were even some familiar faces who had also volunteered at my Art For Oceans beach clean just a few days earlier (a marine conservation/ocean-heavy week, we quipped). but proof of the kindness of people here. 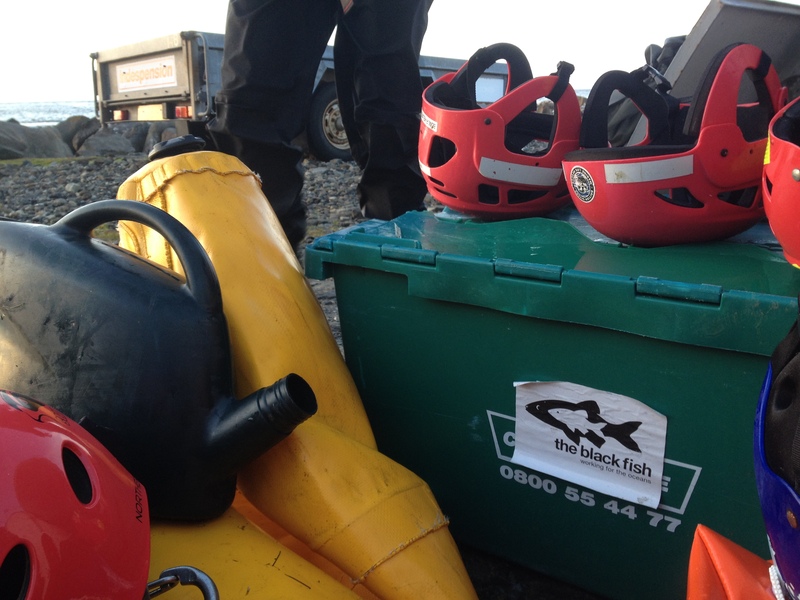 I don’t have any formal training with British Divers Marine Life Rescues so I might have been turned away but in the end I was allowed to be zipped into a drysuit and loaded onto a boat with a pile of equipment to transport us over to the stranding site. It was an ironic turn of events… I had been planning on doing a course with BDMLR ever since meeting their co-ordinator, Stephen Marsh, at Whalefest earlier this year (we both stayed at the house rented by the Earthrace team) and I was going to book into the Stornoway course in a month’s time. Not only that but the day before the rescue I had emailed the Scottish Marine Animals Strandings Scheme replying to a Facebook appeal for new volunteers. It was a ‘just in case’ situation, I didn’t think I’d ever actually see a stranding so close to home. As we landed on the island we were able to see how spread out the animals were and how far up the rocks they had managed to beach themselves. They were large dark masses draped in wet white sheets and towels to keep them from drying out. Small teams sat around each one whilst other volunteers went between them relaying information or equipment. I was directed towards a lone juvenile in a group of 4 whales. The largest of the group was being held upright by a pontoon and attended by three guys who rocked it back and forth and poured water over the whale’s body. The second largest was on its side and was being helped by a volunteer called Laura. The smallest of the group had died before rescuers had arrived and it sat forlornly next to the others. I sat down next to the second smallest, a juvenile, and stared. On first sight, they don’t look like real animals. With their eyes closed their thick black skin makes them look like some kind of rubber model; they seem unreal. But then I sat down next to this one and a sharp breath rushed out of the blowhole. As it did so, all the muscles under that blubbery, tough skin tensed and the tail tremored. Whether human or animal, it was instantly recognisable as a kind of physical discomfort; it was struggling. And suddenly it was all very real. I didn’t expect to be as emotionally affected by the whales as much as I was. Yes, I love cetaceans and I cried when I saw my first sperm whale and my first fin whale (on the same Turmares research trip -it was an emotional day!) But I’ve seen pilot whales many times before, I’m used to them. I’m also used to seeing wildlife in really, really awful situations. One of the downsides of being even slightly involved in conservation means that you regularly come across examples of how careless and cruel humanity can be. There are photos and videos out there so horrible that they’d make even the most hardened old man burst into sobs. 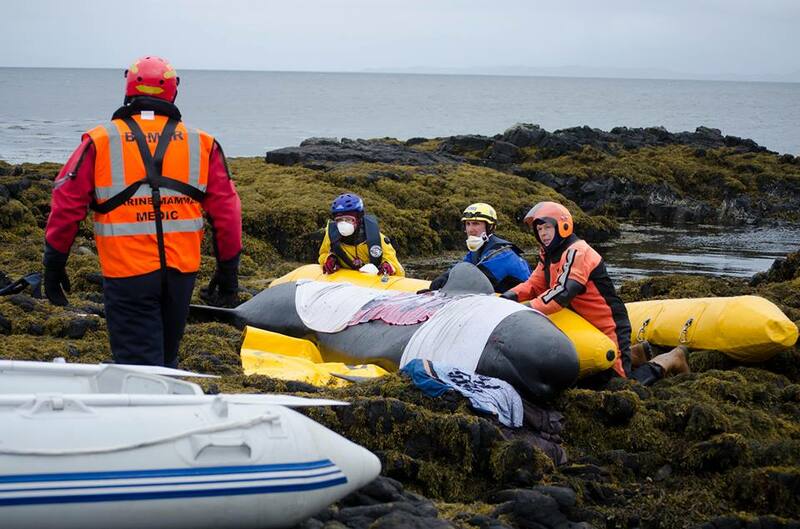 But even being familiar with footage of pilot whales being hacked to death in the Faroese grindadrap hunt didn’t desensitise me enough to come away from the Staffin rescue unscathed. I will never forget those sharp breaths and tensing muscles. That physical struggle. The creatures needed to be rocked gently back and forth to help keep their bodily fluids evenly distributed. The ones laying on their sides were most in danger of having blood build up on the lower side which causes problems with the lungs (the lower one can fill with blood which overstresses the upper one). This additional weight would also cause listing when they reached the open water, making the animal take longer to right itself. Apparently the juvenile I was assigned to had the best chance as it was young and upright. I took my place next to it and began to rock it. I looked up and a masked face was telling me to move. He warned me that the bacteria in the blasts of breath from a blowhole could make a human seriously ill, to the point of hospitalisation and even death. You’ll notice in all the pictures we’re wearing gloves and most of us are wearing masks. This is why. Although Mitchell and I got blowhole spray in our eyes more than once when refloating the larger animals so I suppose we were lucky to not get contaminated. The whales needed to be kept moving, to stay wet and to be made calm. They respond well to human voices, especially to women singing. Don’t get close to the blowhole and don’t let water get into it or they could drown. Make sure that they’re eyes and blowhole are kept moist with KY Jelly. Laura, the volunteer attending the large whale on it’s side next to me, coached me as we sat. 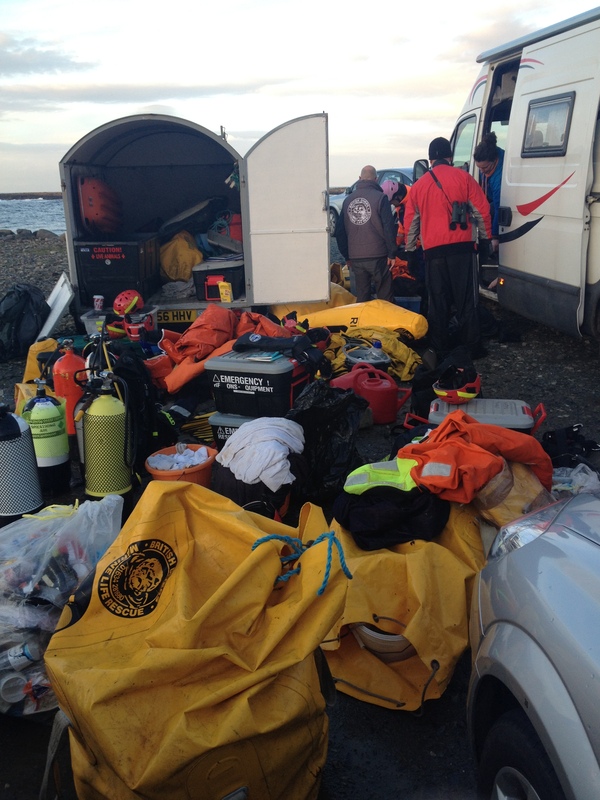 Many of the other volunteers were people who had done the BDMLR medics course but hadn’t yet experienced a stranding. Most had dropped everything and driven for 4+ hours to get to Staffin. This was Laura’s first time but you could tell she was trained and she remained steeled and calm with her whale despite having sat in that same spot for hours on end in the cold. Rain and drizzle was a relief. We volunteers got chilly but it kept the animals wet. We waited and talked and rocked and sang and poured water. I mumbled incoherent sentences into the big rubbery flank and willed this whale to be okay. I hoped that, like dogs, they could somehow sense feel how much care and love was around them. At one point the two whales that Laura and I were attending started calling to each other; a conversation of sad, distressed whistles. I’ve always loved the dolphin noise and whalesong but this was horrible. It was when the large whale resting on the pontoon had gradually slipped down and needed to be propped back up again that I was really hit by the helplessness we all felt at some point that day. My job in the action was to tuck under the lower pectoral fin so that it wasn’t pushed out of place when the whale was moved. I went to grasp the fin and noticed how the skin had been grazed off one side by the rock. It was a rich red with blood and looked so sore. I tried feebly to cushion the fin away from the rock with seaweed but I knew it wouldn’t really stop any pain. I don’t know why this got to me more than anything else. 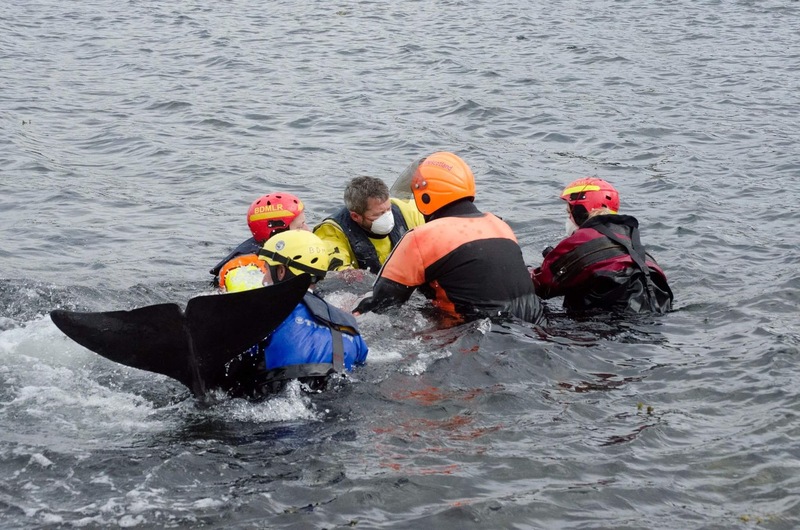 As the command came to move the whale I concentrated hard on the fin and didn’t look up; partly to make sure I’d put it in the right place but mostly to hide my face so that no one saw the tears running down into my mask. When the whales stilled it was easy to forget again that they were living beings. Hours spent staring at the still, scarred dorsal fin felt like looking at a battered old plastic rudder. But then these little things jerked them back into being conscious creatures. I had no need to hide any tears that day (I’m sure everyone there went through the same range of emotions) but all the other volunteers were so determined and focused that I wanted to show I could be too. The animals had stranded at high tide meaning that we had to wait until the next one to get them back out. Looking at the low water so far away, this felt like forever. Every now and again we got up and switched places with another volunteer, warmed up with a cup of tea or popped to the loo. 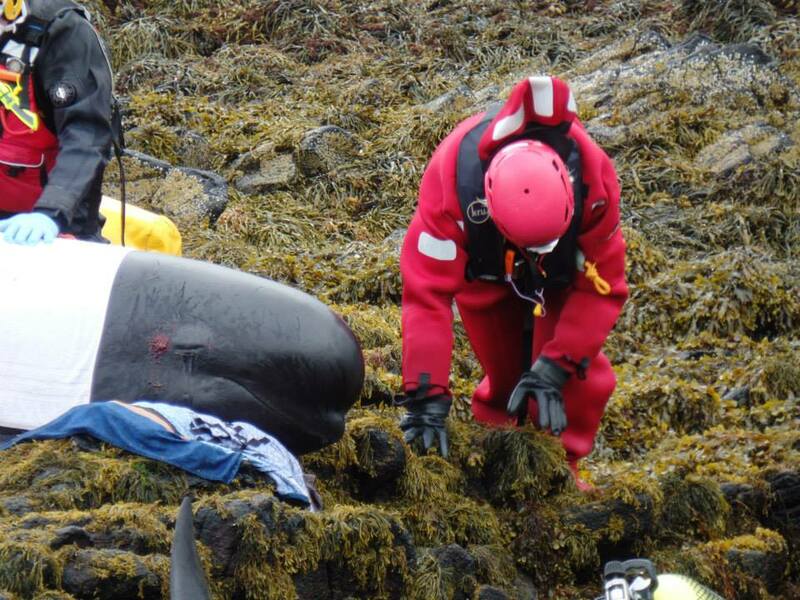 A vet came to assess each whale and one that was bleeding heavily had to be euthanised. Whilst it sounds harsh, I considered how it was ‘lucky’ that these whales were small enough to be put out of their suffering rather than be left to die slowly like larger great whales. A boat came laden with soup and coffee. After hours of being damp and cold we said that this might have been the best coffee we’d ever tasted. It was all hands on deck with the rescue effort. No more hanging around, suddenly we were all needed. Because we were so focused on our particular animal I can’t give an accurate general account of what happened. As the water reached each whale the creatures slowly began to stir, moving their tails in response. Teams of volunteers went to each whale, ready to guide them backwards out of the rocks. Getting ready to refloat the whales on the incoming tide. Mairi and Sam look after the juvenile whilst the larger whale is refloated. You can see Adam and I using a towel to raise the blowholeout of the water. I found myself attending Laura’s whale with Mitchell (Skye Ghillie), Anne (from The Royal) and Adam (a neighbour who runs the Shulista wigwams). The main effort was concentrated on getting this whale upright so that it could be pushed back out. However, those of us at the head end noticed that the rising tide was beginning to breach the blowhole and it suddenly became a rush against time to raise it away from the water. I’ll never forget the stress of trying to hold that whale’s head up. For the first few minutes I sat with my knee wedged underneath, the entire weight of the head crushing it against the rock. As the water rose Anne got her knee under too. Then eventually Adam suggested using a towel as a sling and we grunted and struggled as we tried to grip the towel holding all that weight. Seconds later the whale was righted and we were out in the water. We worked the fins and tail up and down to get the blood and feelings back into the muscles. As we did so the whale began to gain strength and started kicking back against us. Mitchell was getting the full force of awakening fins and as I looked over the blowhole at him I thought of how different this evening was to the one that I’d bumped into him and Sam at the night before…. 7pm on Monday: Bosville restaurant opening with champagne and canapes. 7pm on Tuesday: In the sea wrestling a whale. It’s not as easy as just putting them back in the ocean and watching them swim off. We had to wait for all the whales to be back in the water and moving again before we could let them go. If this didn’t happen there would be a risk of them re-stranding. It wasn’t long until they were ready and, on instruction, we released them. 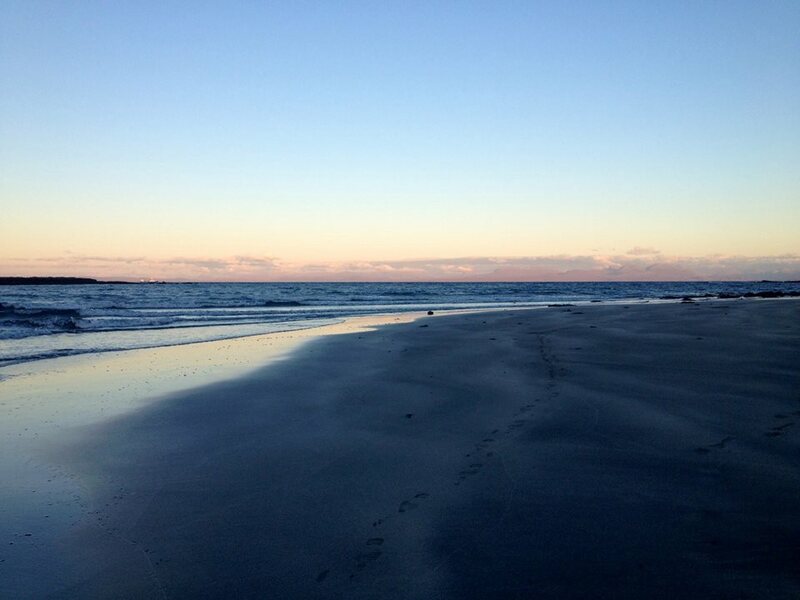 We watched them glide away from us and willed them to regroup. We rushed towards them to shoo them away from the shore as they barrel-rolled over a rocky outcrop. Stumbling and falling over the stones and seaweed we pushed them back and splashed the water to frighten them away. And then they turned and started to leave. The feeling of elation in seeing them swim free in the water is incredible, there really is nothing like it (again, not hyperbole). I glanced at the tired, wind-beaten faces next to me and every eye was bright with hope. From a silly sentimental bugger like me right up to the big tough guys from Marine Scotland (the maritime law enforcers), by now we were all 100% emotionally invested in this little group of cetaceans. I don’t think any of us have ever willed anything to bugger off so much in our lives! As we cleared up and watched the last whales being guided out by the other teams we noticed a rainbow appear. After a grey, drizzly day the sun was breaking through and it felt apt to smile. 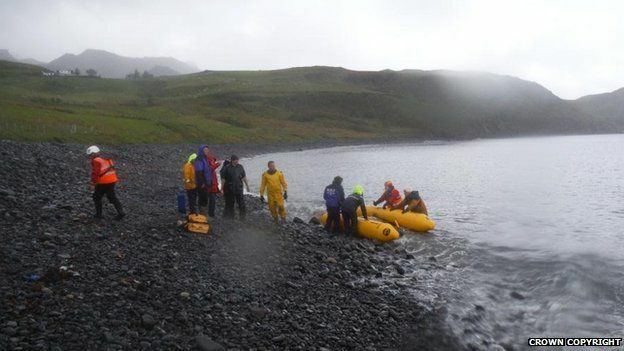 6 of the 10 whales that stranded on Staffin Island were returned to sea. 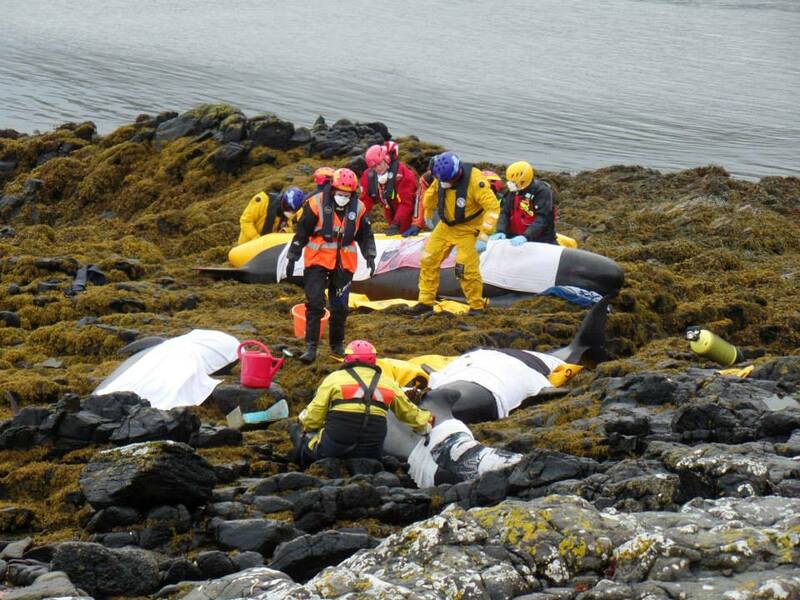 Two had died before rescuers reached the island and two were euthanised whilst we waited for the tide. With the three earlier losses on Brogaig beach it was a hard day. Over the course of it we had all gained an acute awareness of the intelligence of these creatures; not least because of their connection with each other (so much so that they would all strand together). 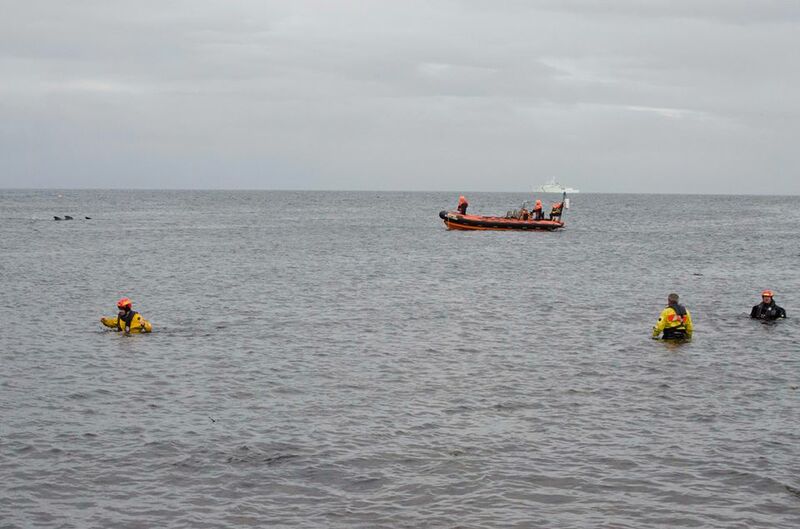 Our personal experiences with the whales were diverse and we’ll all take away different memories from that day but a general respect and sadness for the loss is something everyone will share. With that said, the rescue still had a positive outcome. 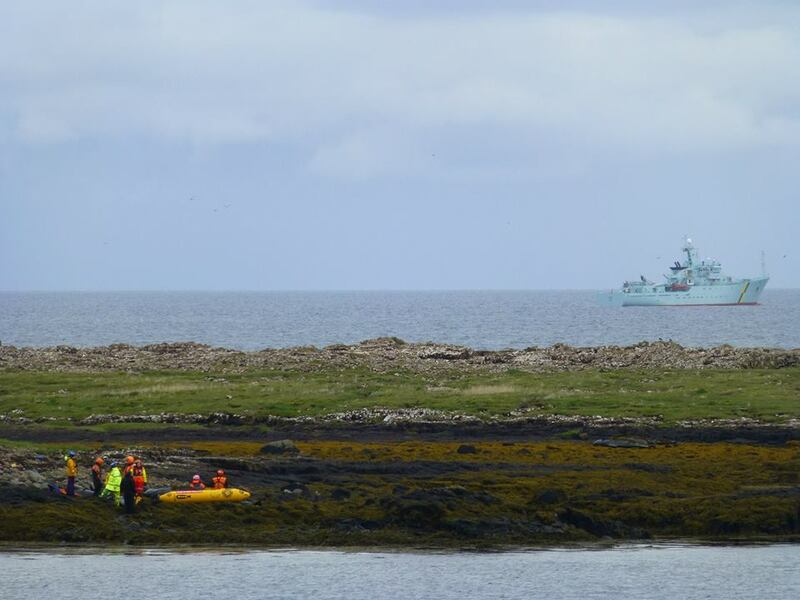 6 were rescued on Staffin Beach and 8 were refloated from Brogaig and didn’t re-strand. At one point there was a suspicion that none would survive from the second rescue attempt. This was a hard rescue in tricky terrain so the outcome was good. There’s the volunteers who dropped everything to come down and help. Businesses and shops were closed and some people drove from the other side of the country to help. Then there’s the support from all the people who stayed onshore. There were the staff at Columba 1400 who made soup and sandwiches, Sally from Shulista Wigwams with coffee and snacks from Staffin Stores and all the local people who came down with food and blankets. I think we all made some good friends that day; the trauma brought lots of us together, people who live near to each other but who’d never had a chance to meet. As we waited for the boat to ferry us back to Staffin slipway we chatted and promised to keep in contact and share pictures. Back on the slipway itself we peeled off our wet clothes (only one person’s drysuit stayed dry!). My toes had turned white from being damp all day and I was half surprised that I hadn’t sprouted webbing between them. We shivered as we unloaded the equipment from the boat. 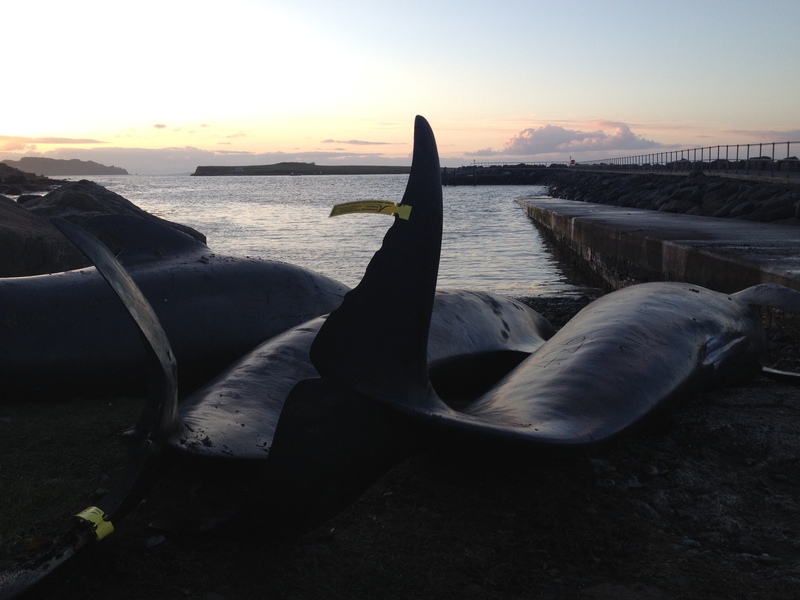 Next to the slipway lay a pile of the deceased whales, towed over from Staffin Island when the tide had come in. They looked elegant and beautiful and unreal. A sad reminder that not everyone made it. I drove my neighbour, Adam, home then staggered into my cottage. It was cold and dark. I felt chilled so I stripped and walked straight into the shower and just stood there. I might have been standing for half an hour, maybe even a whole hour. When I got under the warm water something hit me. This stillness after a day of adrenalin was almost paralyzing; the shock of being back in a familiar space after a day of something so dramatic and strange. There’s only one word that accurately describes this feeling: overwhelmed. I was totally and utterly overwhelmed. As the hot water slowly defrosted my bones and brought me back to my senses I couldn’t help let tears flow freely with the soap suds. It was only a whale rescue but this reaction to it was almost like a reaction to some kind of trauma. I hope I don’t sound like I’m over-reacting here; I’m sure lots of the other volunteers had exactly the same experience. 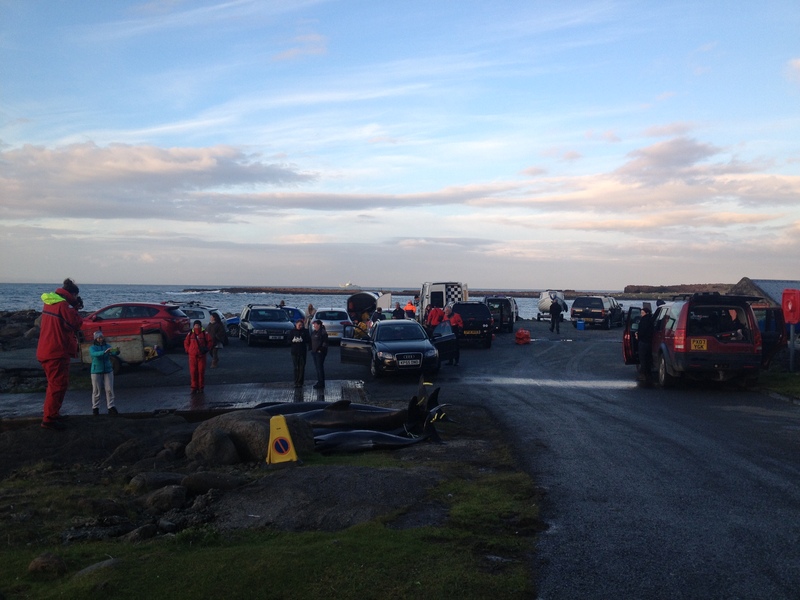 And so that was my experience of the Staffin whale strandings. It isn’t exactly the end to the story but these are the events of the day and the follow-up isn’t as relevant anyway. I usually like to wrap up my blog posts with a tidy little paragraph summing everything up but to be honest I’m too tired to do it this time. Reliving the events, even just through typing, is emotionally exhausting (I’ve had tears in my eyes many times whilst typing this). Firstly, that I’m completely humbled by the kindness shown by the people involved in every part of these rescues. I have often felt down and disheartened by what people can do to wildlife/nature but seeing this amount of love and care is something I will always carry in my heart. 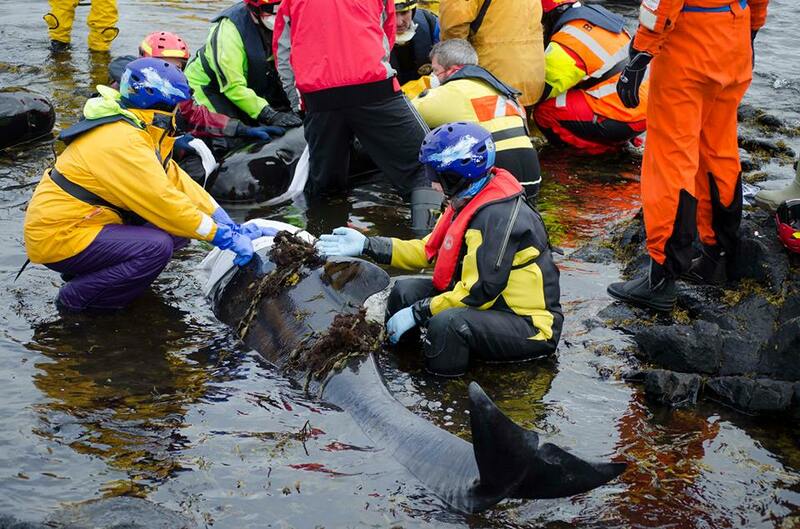 But, if another stranding does happen then we’ll need all the help we can get again. This would be through trained volunteers or via fundraising for local equipment. 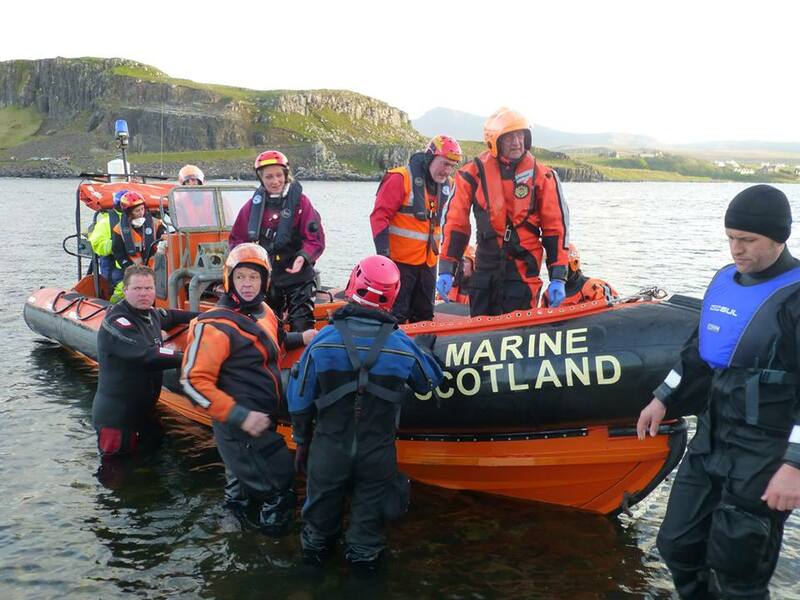 Noel H from British Divers Marine Life Rescue has set up a campaign to raise money to buy a pontoon for rescues in NW Scotland. If anyone can help to put a few pennies into the fund then please visit his Just Giving page here: Noel’s BDMLR NW Scotland Pontoon Campaign. If you think you can help out by becoming a medic then please check out the BDMLR website to find a course in your area here: BDMLR Courses. If you fancy coming on the Stornoway one in July then I’ll see you there!